Adding a touch of black is always a good decision. And with our black rapphia ribbon, that decision just turned from good to great. This simple black ribbon with a twisted texture will bring class back into gift wrapping. No longer will your gifts be tacky or too much. This black ribbon brings a simple touch that will please any eye. Black Wraphia ribbon is the perfect accessory for your gifts, arts & crafts, home decor, and more. And it will tie into everything ... literally. Black is a great neutral color so whether you tie the ribbon to a clear vase with a beautiful bouquet of roses, tie it around a hot pink birthday wrapped present, or tie it around your Halloween crafts, it doesn't matter - any event, any item, anything will match with our black ribbon. 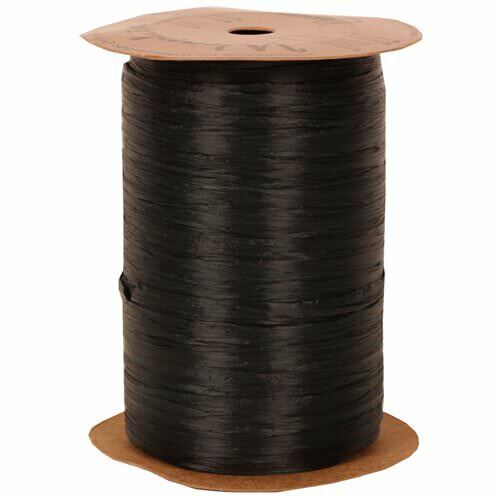 Black Rapphia Ribbon measures out to 100 yards a spool with a width of .375 inches.